The tale of our Japan adventure is less than half-done, so let’s get cracking! We travelled down from the mountaintop and made our way back to our hostel in Kyoto. Still possessed with a unslakable thirst for temples, we made our way to Kiyomizu-Dera. On the way, we passed by Wakamiya Hachimangu, also known as the “Pottery Shrine” — an annual pottery festival is held nearby (though, sadly, not at the time we were passing by). These prayer lanterns are everywhere. They’re quite lovely! I’m not sure who this shrine is for, but it’s a lot smaller than the ones next to it. After climbing a reasonably steep hill, we found ourselves at Kiyomizu-Dera. It’s an ancient temple (first founded over 1200 years ago!) which overlooks the city of Kyoto. No idea what this building is for, but it’s quite striking! The details on temples’ roofs in Japan never fail to impress. The temple is really quite high up. The temple is quite a large complex, and many parts of it still appear to be open for ritual use (e.g. for weddings). As with many culturally significant sites that we visited, the place was swarming with schoolchildren, all sporting colour-coordinated hats. 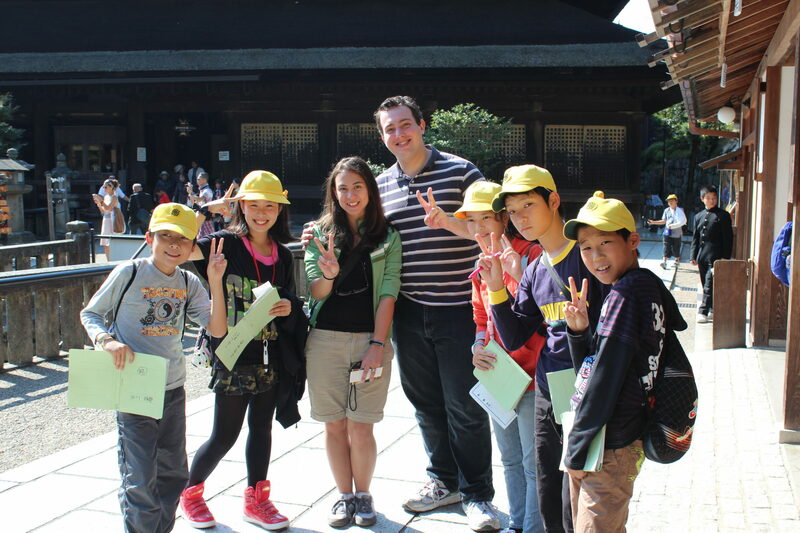 As in Hiroshima, the children were eager to practice their English on us. This time, however, their teacher also approached us and struck up a conversation. His English seemed a little rusty, and our conversation mostly consisted of a few tourist-friendly phrases (“How is your trip? Do you like Japan?”), but he seemed quite proud of the fact that we could understand him and that he could, in turn, understand our responses. His students looked on, visibly impressed with his command of the foreigners’ tongue. The Japanese may not have invented high-visibility hats, but they have perfected them. Kiyomizu-Dera is all about water. It was built around the Otowa-no Taki Falls in antiquity; the basement of the main hall is kept dark to simulate the womb of a motherly Buddha; the name literally translates to “pure water”; and the main attraction of the temple is a wishing spring flowing with holy water. I will spare you the dozens of hilarious Legend of Zelda-inspired water temple jokes. Anyways, people were lined up for a chance to collect holy water from Otowa Spring. A small price to pay for the chance to have all of your wishes granted. Sure, the line is long, but for the literal fulfilment of my wishes I’m willing to wait a tick. Visitors often attribute particular meanings to each stream (e.g. health/love/wealth), but the temple takes no official position on this practice. Kat didn’t tell me what she wished for, although I’m not sure that the wishbone secrecy rule applies. We wrapped up at the temple and caught a bite to eat at the nearby Oblio Dolce Caffe & Ristorante. Reading the name out just now, I suppose that we should have been less surprised that they primarily served pizza and pasta (and coffee, one assumes). We had gotten used to not reading signage, so when we sat down we were expecting some Japanese cuisine. Still, we were not disappointed. We trekked down the hillside, which is absolutely crammed with shops. Kat is included in this panoramic shot of the shopping street for scale (and also because we love her). The upper floor of this shop could not be more adorable. This dog has got it figured out, I think. Tucked into a corner was a Studio Ghibli shop! The Missus was overjoyed. (Studio Ghibli is a Japanese animation studio which is critically acclaimed and has come to some renown among international connoisseurs of anime.) We were only allowed to take photos outside, but the inside was a veritable cornucopia of things which (a) caused The Missus to squeal and (b) we had no room for in our luggage. The Missus was less overjoyed by this latter fact. No cameras permitted beyond this ever-watchful Totoro. Now, I haven’t mentioned this previously, but all over Kyoto there were fashionable ladies wearing traditional kimonos (complete with the wooden shoes and fully-made-up faces). The Missus and Kat regularly stopped these ladies with photo requests, and they were rarely rebuffed. These encounters solidified one dream, one desire, one all-consuming passion in my travelling companions: they, too, had to spend the day in kimonos. Kat (my lobster friend, recall) looked pretty rosy against these painted-white ladies. Amelia may not be in a kimono, but she’s got the poise down already. We wandered along by a pay-for-admission garden (and/or temple?) complex. It probably has a name and/or some cultural significance, but neither of these have survived in our memories. It was super-idyllic, though; every blade of grass and incense stick seemed to be placed just-so. I guess they can afford some serious maintenance staff with those sweet, sweet tourism dollars. The rock garden was nearby (though not technically part of the complex). … this mega-adorable little shrine! Later, we walked through a public park. It was also immaculately manicured and mega-adorable, and it had the added benefit of being absolutely free! Well, at least for us, the non-tax-paying visitors in the country. Although from a strict accounting perspective I suppose some portion of our airfare and accommodations could be attributed to our visit to this park. Clearly further research is needed. On a (potentially?) more interesting note, we ran into an editor of japan-guide.com in the park. It turned out that it was the very same guy who’d written the entry on Koyasan that we’d used to plan our trip there! He was even nicer than one would expect. Unreasonably nice. Unfairly nice. His niceness upended my fundamental understanding of the concept of niceness and left me a quivering wreck. But I couldn’t be mad at him for it — he’s so nice! Unfortunately, I was so busy dealing with this minor existential crisis that I neglected to get a photo (and so the question of whether such a being can be caught on a mundane camera remains unresolved). Instead, I snapped some photos of the surrounding scenery. I did not eat these berries, though I was sorely tempted. Many pathways stretched through the park. This one was not going towards our hostel, though. Here it is, the one obligatory photo with me in it. Hi, mom! As dusk began to fall, these garden lights began to glow softly. As night began to fall, Kat and I tried our hands at some low-light photography. In particular, we set up shop at the gates into the park and tried to catch a good time-lapse photo of the traffic passing by. Prayer lanterns really do look better when they’re, y’know, lanterning. It took an embarrassingly long amount of time to get this photo, and I’m still not happy with it. While we were doing this, some passing foreigners stopped to chat. One of them, Brendan, happened to be a computer science major at the University of Victoria (where I was going to law school), which was quite the coincidence! We chatted about software patents and copyright term extensions — you know, breeze-shootin’. He brought along with him Sigurd (“Shaggy”), from Norway, and Sofia (“Su”), from Portugal. We were fast friends, and it wasn’t long before we tracked down a hole-in-the-wall sushi bar and took it over for the night. The sushi bar was literally just that — one chef working behind one bar with seating for 6. We were his only customers, because we were the only people who could fit into his one-room restaurant. Being savvy travellers of the world (and having read a travel guide which recommended it), we told him how much money we wanted to spend and asked that he serve us whatever he wanted to get us to that amount. Shaggy opted out (he didn’t seem to trust that he wouldn’t be bankrupted in the process), but the rest of us ate like kings that night. We were served a variety of raw-fish-based dishes. It was delicious. This is a real wasabi root. It gets grated using that board. They’re notoriously hard to transport, so most wasabi in Canada is really horseradish. Some of the food we could actually recognize! The ladies wanted a group shot with our chef. He seemed to appreciate the attention. Our chef was really a good sport; he even took Su behind the counter to try her hand at slicing some sushi rolls. We had a great time. I would tell you the name of the restaurant, but the English sign just said “Sushi and Bar SPOT” — perhaps it’s catchier in Japanese. Although dinner was soon done, we were not done having fun with our new friends! We headed back towards our hostel in search of adventure. And we found it! 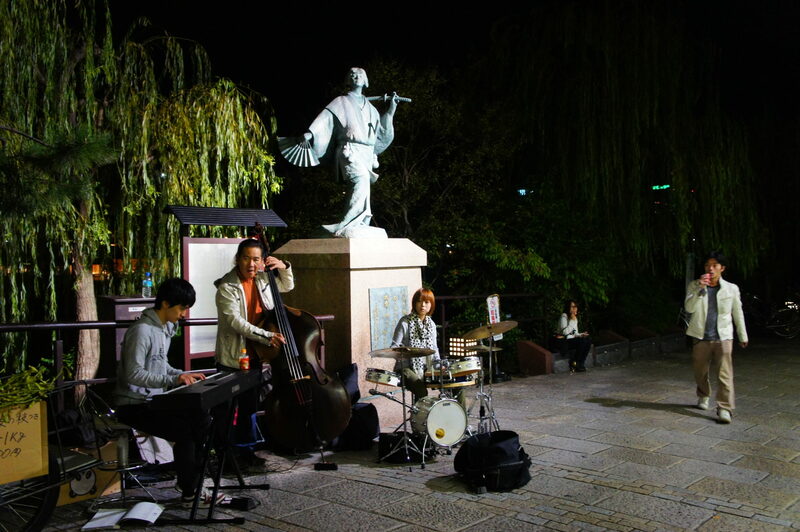 Well, first, we found a late-night streetside band fully equipped with a keyboard, cello, and drums; evidently busking is pretty serious business in Japan. Why is everything so much better in Japan? It’s embarrassing for the rest of us. We ended up finding a bar in the alleyway behind our hostel. The bar advertised its signature gimmick — namely that everything was ¥300 (though you needed to buy three drink/appetizer tickets to get in). ¥300 is about CA$2.25. That might sound sort of sketchy, but the sign out front very reassuringly promised a friendly atmosphere so we figured we’d give it a shot. Kat aimed to learn to mix a signature drink in each country she visited. The bartender clearly approves of her progress. Not being a drinker, I immediately applied my used my tickets on food. This burger was $2.25! I was in heaven. The sign was true to its word; the inhabitants of the bar were very friendly, and a grand time was had by all. As the night wound down, we bid each other goodbye, exchanged Facebook information, and went our separate ways. And that is almost — almost — where the story of our Kyoto visit ends. Except that there’s one more important feature: Monkeys. The following morning, The Missus took the early train off to Tokyo to meet up with our friend Shawn (“Naka”), whom we had demanded join us for the second leg of our Japan trip. While she was doing that, however, Kat and I made a detour to Arashiyama Monkey Park, which is exactly what it sounds like (assuming that it sounds like a park for monkeys, which is what it is). This park is perched atop a rather tall hill and is home to over 140 wild snow monkeys (or “Japanese monkeys”), a breed with bright red faces and buttocks. I would make a dig at Kat’s (you know, my lobster friend) bright red face, but after our lengthy climb up the hill’s stairs, I was also sporting a cherry-red visage. I did not inspect our buttocks for hue, but I suspect they were spared. We were free to wander among the monkeys, as well as enter a fenced-in structure where the monkey food was kept. We passed peanuts through the fence, much to the monkeys’ delight. I must have taken a hundred photos of Kat feeding monkeys, but I don’t seem to have them on-hand. You’ll have to settle for a photo of me. The monkeys don’t get all their food from tourists; there’s a park employee who goes out with a feeding bucket. The monkeys yearned for freedom. No, wait, they were on the outside. Perhaps they yearned for peanuts. A monkey surveying his domain. We spent a fair amount of time snapping photos of any ol’ monkeys that passed by until, suddenly, we saw him: an adorable baby monkey. We followed that little scamp around for a while. He was quite photogenic. (Please do not ask me how I know it was a boy-monkey; it will detract substantially from the adorability quotient). Look at him eat his food with that adorable face. He’s sitting by an adorable pool on his adorable tush! Here he is, doing his adorable bar exercises! This baby monkey is adorable. With our hunger for adorable monkey photos momentarily sated, we headed off for Tokyo to meet up with The Missus and Shawn. Plenty of new (and very fashionable!) adventures awaited us! 18 February 2015 11 February 2018 Christopher ScottComments are off for this post.